The GracePointe School of Dance will present Aladdin at the Hexagon Theatre in Pietermaritzburg from July 27 to 28, 2018, featuring a cast of dancers aged from 4 to 16. In a middle-eastern town, Princess Jasmine is feeling trapped so she sneaks out of the palace incognito. She forms an instant connection with Aladdin, a charming street urchin and thief. Jafar, the wicked chancellor saves Aladdin from being cast in the dungeon by ordering him to fetch a lamp from the Cave of Wonders. Aladdin’s adventures are about to begin. Where there is a Slave of the Ring and a Magic Lamp and a Genie, anything can happen! Will Aladdin’s new identity as “Prince Ali” help him win Jasmine’s heart and thwart Jafar’s evil plans to take over the throne? Will the Genie’s wish for freedom ever come true? 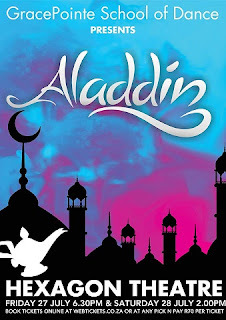 Aladdin has shows on July 27 at 18h30 and on July 28 at 14h00 at the Hexagon Theatre, Golf Road, UKZN Campus in Pietermaritzburg. Tickets R70 available on webticketshttps://webtickets.co.za/events/theatre/gracepointe-school-of-dance-presents-aladdin/1481890590 or at Pick n Pay stores.